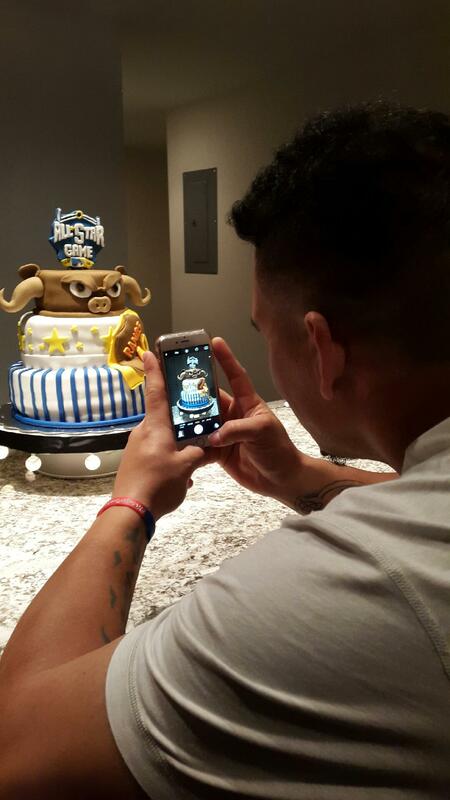 Wilson Ramos is going to make some cake! Pay the man! Wilson Ramos is going to get paid no doubt, and we hope it will continue to be on the Nationals’ payroll for many years to come. Wilson Ramos is set to become a Free Agent after this season unless the Nationals extend his contract. It seems both sides would like this relationship to continue as the All-Star catcher is putting up monster numbers this season, and is winning games for this team like Ramos did on Sunday with the only run scored in the 1-0 win to beat Madison Bumgarner and the Giants on his home run over the rightfield wall. If there have been any conversations with Ramos’ agent at Octagon, it is news to Ramos as he has not heard of any as he recently told the media. When Wilson and his wife Yely decided to purchase their first home last year, they strategically looked for a home close to the Nats’ new spring training facility in West Palm, and they purchased a home in Parkland which is about 20 minutes away. That commitment further shows that Wilson is thinking long-term about his future with the Nats. Ramos who is batting .336 with a .933 OPS and a 12.6 K rate is leading catchers in almost every offensive category, and while some of this success can be attributed to his off-season LASIK surgery, much can be credited to his opportunity to remain in the United States over the winter and work-out with his personal trainer to get himself into the best shape of his life. Ramos was named an All-Star this year, and the best is yet to come. Ramos is legitimately putting up MVP worthy stats, and he is sure to get many Top 10 votes along with teammate Daniel Murphy. Ramos is a +3.2 WAR, and Murphy is +3.7. They both also rank number 1 and number 2 for the NL Batting Average crown. Ramos is batting .375 in Hi Lev spots and .351 in RISP. Ramos posted up videos for his fans on his Twitter and Instagram accounts during the winter, and it gave optimism that the Buffalo was going to show up in Spring Training in the best shape of his life….and he did. Wilson Ramos just turned 29-years-old 2 days ago. To celebrate his birthday, LiLi Mayorca flew to Washington, D.C. to be with him and the Ramos family. Mayorca, who was born in the United States, is of Venezuelan descent and has been like a second madre to Wilson. Mayorca brought some tools with her on the trip to DC as she was going to make Wilson two cakes for his birthday. Yely, who is Wilson’s wife, wanted an All-Star theme, and Wilson of course wanted a buffalo on it. Mayorca was up to the challenge to accommodate both wishes. Mayorca, a few years ago, became a self-taught cake maker by watching YouTube videos, and we aren’t talking the type of cakes that Lucas Giolito was baking in spring training although we suggest the two collaborate on some cakes in Spring Training 2017. Mayorca’s cakes are artistic creations like the ones you might have seen back in 2006 when Ace of Cakes became a hit show on Food Network and an entire industry of cake art was born. What started as a hobby for Mayorca, is now a part-time business out of her home near West Palm Beach, Florida where she does cake and fruit designs. “This is what I love to do,” Mayorca said. “I stayed up to 4 A.M. to finish Wilson’s cake. The smile on Wilson’s face made me smile.” Mayorca has been through the tough times with Wilson years ago after his leg injury, and the great times now. She is so proud of his accomplishments. She is a loyal person, and her reputation has carried over to her business as business is booming! When you travel to West Palm next year for Spring Training, you must order a cake or fruit design from LiLi. Her phone number is 954-394-5081. Mayorca also makes several trips to Washington, D.C. during the baseball season to see the Ramos family so she might be able to fulfill a cake order in D.C. if the timing works out. Mayorca’s prices are probably half of what you would pay at Ace of Cakes and from what we have heard, LiLi’s cakes give you home run power! 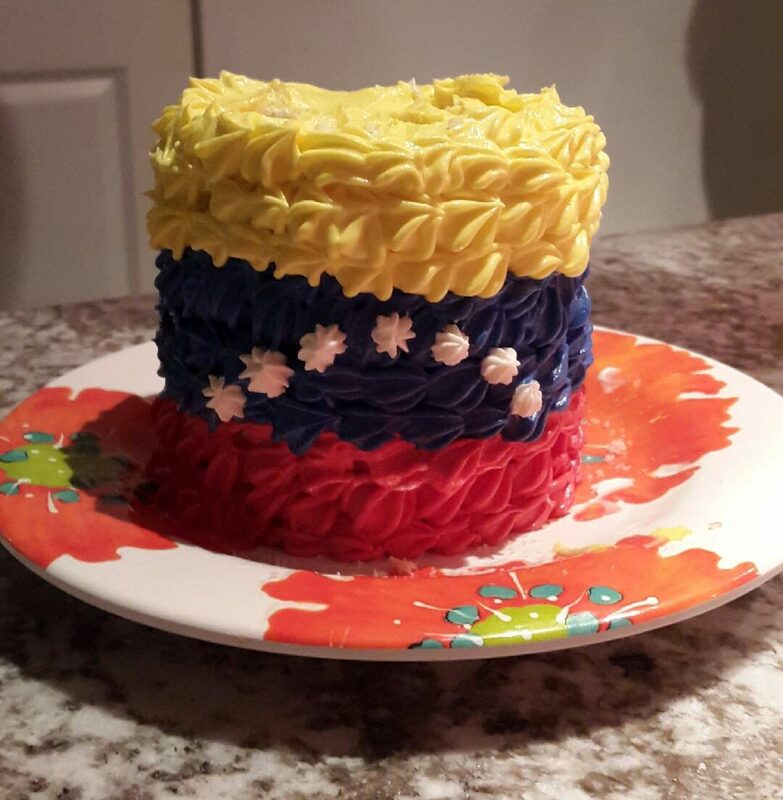 This is a Venezuelan flag inspired cake that was ready at midnight for Wilson’s cumpleaños celebration. 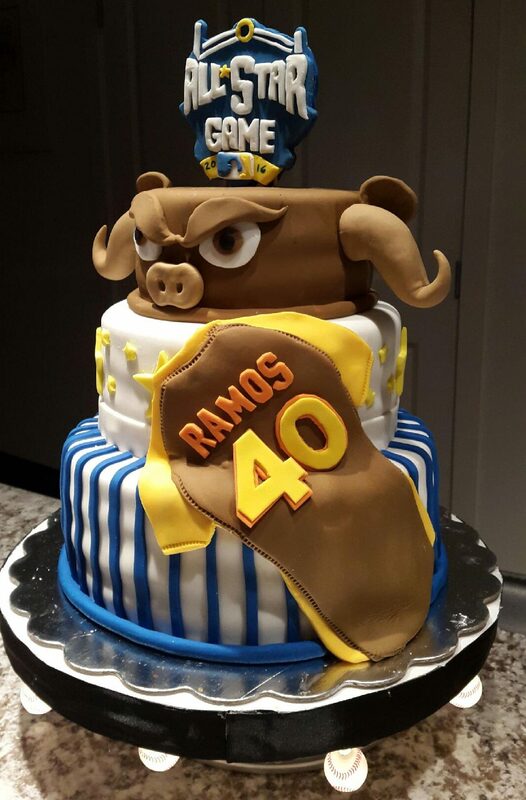 Yes, Ramos wants his cake and eat it too, and why not, he deserves it and has earned it. This entry was posted in Ramos. Bookmark the permalink.